Capris, over-the-knee boots, pointy shoes, asymmetry, jodhpurs – these are trends to some but have always been members of my fashion cabinet. I have loved and worn capris for as long as I have loved fashion (those who know me, know that I remain loyal to my true loves – they just become updated versions in my closet). Capris have been given a bad wrap in recent years. They have been relegated to the mall and the proportions have been way off. I have never liked the wide capri, or the casual, shorter version. To me, capris should be skinny or slightly flared, and always, always, always well cut and proportioned. Thanks to Giles Deacon, the tailored capri is back. Paired with a silk cap-sleeve blouse and a slingback, they are picture perfect. 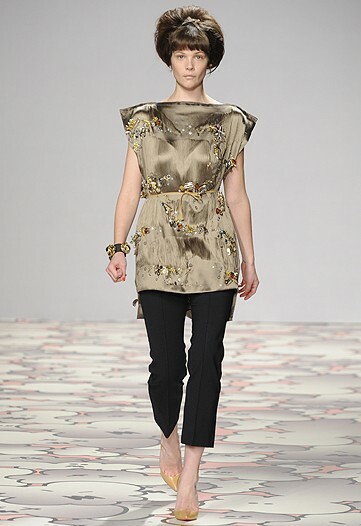 Capris, captured perfectly at Giles FW10.